They say first impressions count. Well, new recruit Peter Crouch required one training session to gauge just how strong and well-structured the squad is at Burnley. 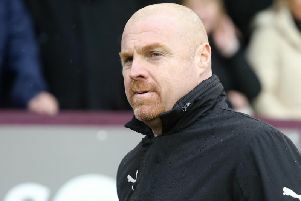 The 38-year-old was handed his Clarets debut by boss Sean Dyche in Saturday’s stalemate against the Saints, only a day after meeting his new team-mates for the first time at the Barnfield Training Centre. Crouch has been impressed with what he’s seen in the embryonic stages of his move and he’s used this week, ahead of Saturday’s game against Brighton in East Sussex, as an opportunity to further embed himself in to the group. “For me it was a no-brainer to come here,” he said. “The club is in the Premier League, I know a few of the players, I know the manager is very good. I wanted to play in the Premier League again and at a club that really suits me. The former England international, who scored 22 times in 42 appearances for his country, had been, according to Stan Ternent’s book, Stan The Man – A Hard Life In Football, closing in on a move to the club in 2001, only for circumstances to change that. However, the striker, who has scored 108 goals in 462 games in the top flight for Stoke City, Liverpool, Spurs, Aston Villa, Southampton and Portsmouth, revealed that he’s always admired the Clarets from afar. He’s played against the Clarets 12 times during his career in spells with QPR, Pompey, Norwich City, Spurs and the Potters, scoring on two occasions. “I was very keen,” he said. “When I came here I knew it was a good dressing room, I knew there were players who want to get the ball in early and play in to the strikers. “I remember watching Burnley in previous years, and playing against them, and I looked on a bit enviously at the centre forwards because they do get crosses in and that’s what I thrive on. “Hopefully I’ll get a few chances and make them count. I’ve really enjoyed training, they are a great bunch of lads. They’ve really helped me settle in and hopefully I can bring a little bit to the team.